Rickie Lee Jones. Archie Shepp. Jacques Higelin. Manu Katché. MC Solaar. It could be the poster for a summer festival. Here, it is the reverse guest book of a decoration idea created by interior designer Philippe Maidenberg, who is behind numerous Parisian hotels, including Le Six, rue Stanislas, le 123, rue du Faubourg-Saint-Honoré and the Joyce. Boldly, Philippe went to ask these artists, singers and jazzmen to get involved in the decoration of this 3-star hotel judiciously situated at voice range of the Olympia concert hall. Everything from the furniture to the ambiance, reminds the stage atmosphere, the backstage, the gigs, the dressing rooms or the studios. Up to the point where Maidenberg drew a stage tool as requested by saxophonist Archie Shepp, manufactured by the Pleyel workshops. No wrong note in the decor: the melodious graphics have been designed by his brother Michel Maidenberg, Creative Director of the Faux Q magazine. 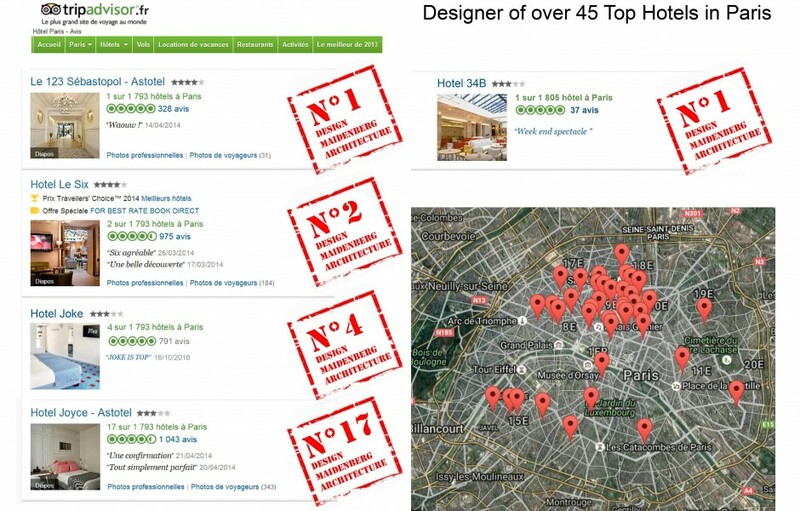 With seventeen hotels in Paris, The Astotel Group is one of the most enterprising of the space, targeting the convenient market of the 3-star hotels, for which the group expands the category in three levels to better distinguish its concepts. The Joyce, inaugurated in 2009, is in the “prestige” category, on paper at least, while its decor and services make it an amusing address full of malicious decoration ideas signed by Philippe Maidenberg, who already accounts for several hotels for this very chain. 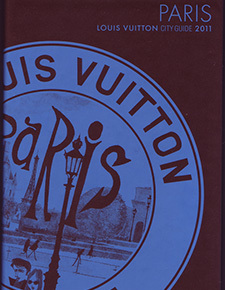 Common themes: Paris, with an Eiffel tower upside-down, and the trompe-l’œil with its headboards drawn on the walls. Fasten your seat belt for breakfast time, in your car seat that includes the headrest. Just opposite, the Monterosa (30, rue La Bruyère. IXth. Tél. : 01 48 74 87 90), 36 bedroom hotel by Astotel also designed by the architect. Charming Langlois, ex-Hôtel des Croisés. How many times have we walked passed it swearing to walk in one day. It was not until the new VU gallery opened, in the former private mansion of the painter Paul Delaroche, just opposite, that we decided. And right there we experienced the delicious shock of time travel: a decorative mix of all Belle époques — the hotel opened in 1896 —, the inside appeals to the visitor with its passé charm, its ambiance of another era, kept with a smile. 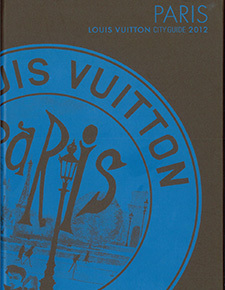 The “Nouvelle Athènes” revived. The lady at the entrance gladly shows us around: the elevator, the corridors, the pastel 1930’s and 1950’s in the large bathrooms, the lamps… Which button did we push to find ourselves in 1955? Just add Françoise Arnoul in her nightie and you are reenacting a part of La chatte sort ses griffes. Plan to sleep there and bring with you a book by Léo Malet. Boulevard… bones, for instance. The plot of these “New Mysteries of Paris” is taking place in the 9th arrondissement. Very suitable.